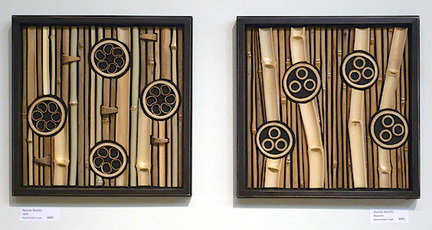 “Uplift” and “Blossoms” are my bamboo mosaics, currently at the Works in Wood 2011 Exhibition at New Hope Arts. 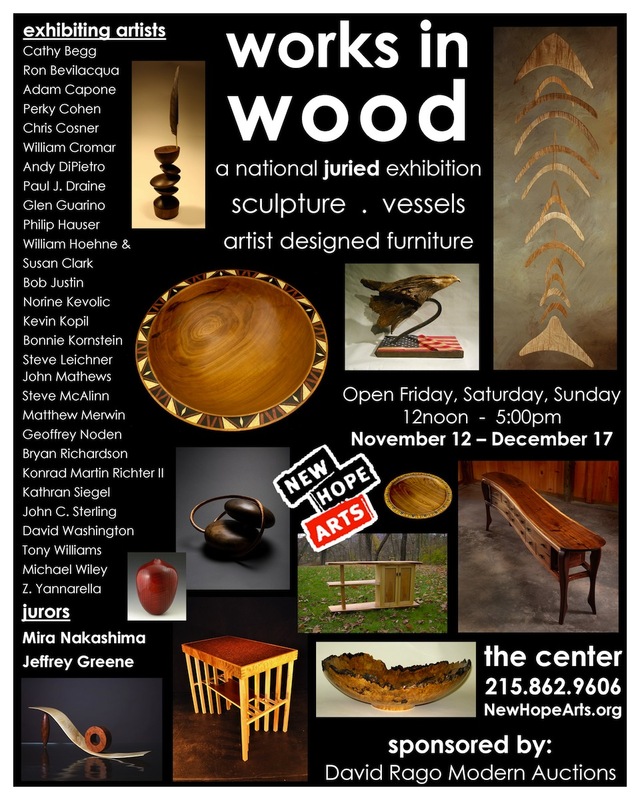 Works in Wood 2011 runs through December 17th – there’s nothing like it! Visit New Hope Arts for details. At the bottom of this poster you’ll see a detail of “Uplift” – one two bamboo mosaics I have in this show, which received a mention here. This article by Gwen Shrift gives a great description of what’s in store for the curious viewers! Wishing you a Happy Thanksgiving! Many thanks for your interest in my blog! It’s that time again! 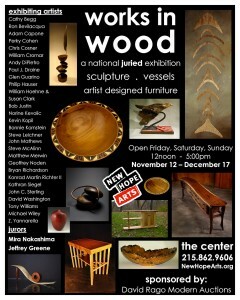 You never know what to expect from artists who work with wood. 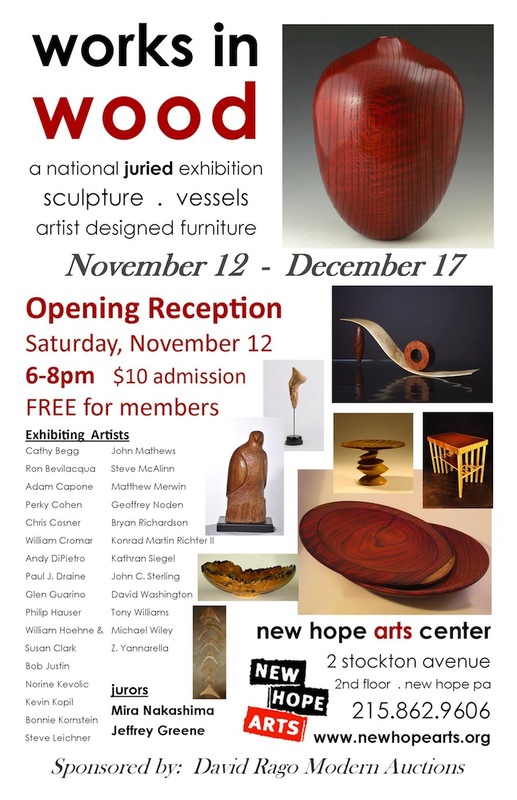 Join us at the opening reception on Saturday, November 12 if you can. We’d love to meet you! See poster for show dates and all details. Never cease to be amazed! Check out the current online exhibition – “Small Treasures” – on Crafthaus. It is wildly fascinating! 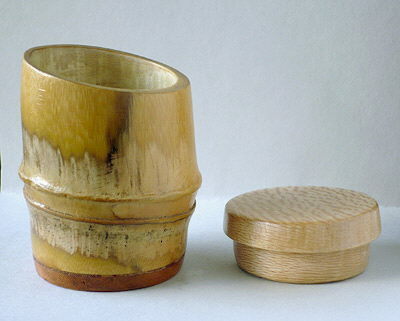 This is my submission to the show, a small bamboo container 2.5″ high x 1.75″ wide. 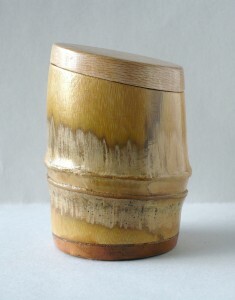 Read more about this, and all the other artist entries at “Small Treasures 1” on Crafthaus online. Almost canceled it due to flooding on the east coast, and in my studio, but decided to get outta town for a week – destination Santa Fe, NM! 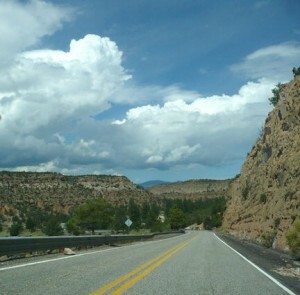 It was a great adventure hiking and climbing, flea marketing, gallery hopping, pueblo touring, and tram-riding to the top of the Sandia Mountains in Albuquerque just before flying back home to Pennsylvania. Miriam Rowe curated an interesting idea for a Crafthaus online exhibit – she asked artists to take a series of photos showing the evolution of a creation from start to finish. 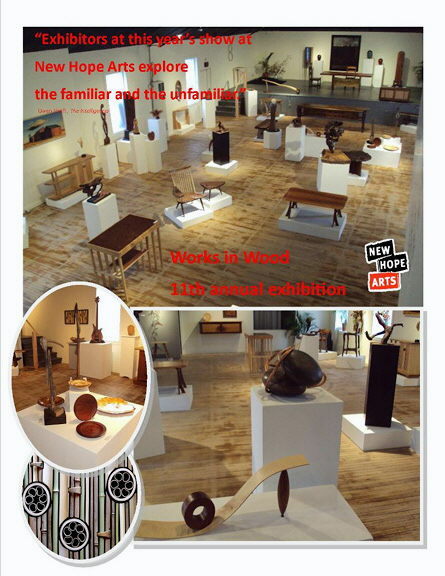 Click here to see for yourself the wide range of talent and materials – and all that goes into a work of art! My 6-slide “Piece Progressions” is of a bamboo mosaic from selection of bamboo poles, to cutting and detailing, to finish work titled Falling. It’s listed on the Crafthaus page under Norine Kevolic. I’m a partner in the Artists’ Gallery, an 18-member co-op in Lambertville, NJ. In April we were invited to take our work on the road – to the spacious halls of the Clarkson S. Fisher U.S. Courthouse, 402 East State Street in Trenton, NJ. The work will be up until September 15, so please visit if you’re in and around this historic river area. 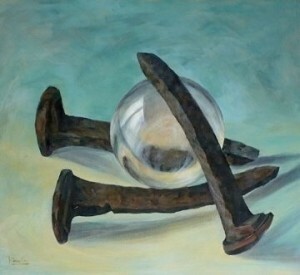 See the Artists’ Gallery website for info, images, and all the details you’ll need. 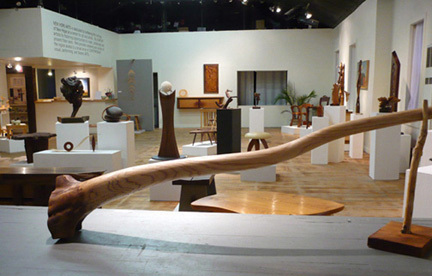 The Artists’ Gallery is a partnership of 18 established and regionally represented artists with national and international reputations. The Gallery is located at 18 Bridge Street in the heart of historic Lambertville, New Jersey, and is open every Friday, Saturday, and Sunday from 11 am to 6 pm and at other times by appointment, 609-397-4588. Or feel free to email me with any questions. I have quite a nice selection of wood varieties in my workshop, assorted scraps that fellow woodworkers have saved for me. And now I have the perfect idea for combining them – these small containers! I cut this piece of bamboo on an angle, and figured out a pleasing thickness for the wood caps. I sanded through the outer skin where bamboo meets sycamore lid and cherry base, leaving the node area in its natural state. The lid is shaped to fit inside the bamboo about 1/4″ and is an interesting piece of wood in itself. 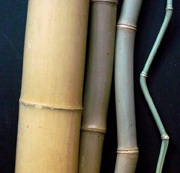 I sand and sand until the edges feel like a natural extension of the bamboo. 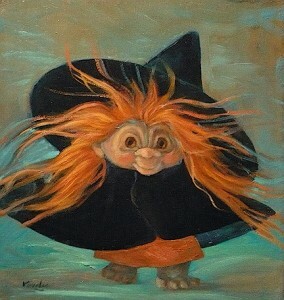 Please email for purchase of this painting.